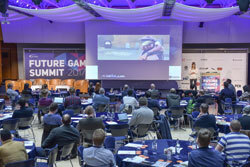 A straightforward venue search using Google led NewBay Media, the organisers of Future Games Summit, to London’s Congress Centre for a 2-day action-packed event in the autumn. The hi-tech summit brought together 350 creative artists, developers, producers, business leaders and technology gurus to explore the impact of future technologies, business trends and creative innovations on the interactive entertainment industry. A jam-packed programme of content was delivered over two inspirational days across three stages: Future Tech; Future Business; and Future Develop. To facilitate the fast-moving three-track programme, events took place concurrently in three of Congress Centre’s most popular spaces: Congress Hall; Invision; and the recently launched Congress Suite. Speed networking and drinks receptions ensured that the 2-day event was both lively and sociable, while the first official Game Jam, a competition for established and aspiring game developers sponsored by YoYo Games, added an exciting twist. Congress Centre’s range of in-house equipment was put to good use by the organisers during the event, and the many hand-held, lapel and table-top microphones, as well as the venue’s multiple giant plasma screens, projectors and PA systems, were in constant use. A steady supply of tasty food ensured that delegates didn’t go hungry during the event. On arrival they were greeted with fruit, granola yoghurt pots and cinnamon buns and, as each day progressed, they enjoyed oven-baked cookies, a delicious finger buffet, afternoon tea and cakes and evening drinks.